Patong Beach has to be one of the most famous in Thailand. If you have seen a brochure or images advertising Thailand online, there is a good chance you have seen pictures of Patong Beach. For those who have considered or visited the island of Phuket, you will know Patong Beach well but not its not only a great place to have a traditional holiday. There are several fantastic golf courses near Patong Beach and a stay in this region of Thailand is rewarded with some excellent days on the golf course. In fact, Patong Beach provides the perfect opportunity to enjoy a combined beach and golf holiday in Thailand, with high quality golf courses throughout the area. When planning a golf holiday to Patong Beach, the first thing you must do is consider the climate and the best time of year to visit. Thankfully for those living in the northern hemisphere, the months between December and March are the perfect time to play the golf courses near Patong Beach. The average temperature is around 24°C to 32°C and humidity is at its lowest of any point during the year. Coupled with blue skies and gentle breezes, December through to March is the best time to visit the golf courses near Patong Beach. However, you can also enjoy sunny days on the golf courses near Patong Beach in April and May. This when the temperatures are at their highest and the increase in humidity also adds to the hottest time of the year. September and early October is considered the low season for playing golf in this region of Thailand. These months see the heaviest rainfall and while you can still enjoy playing golf, the weather can be unpredictable at times. 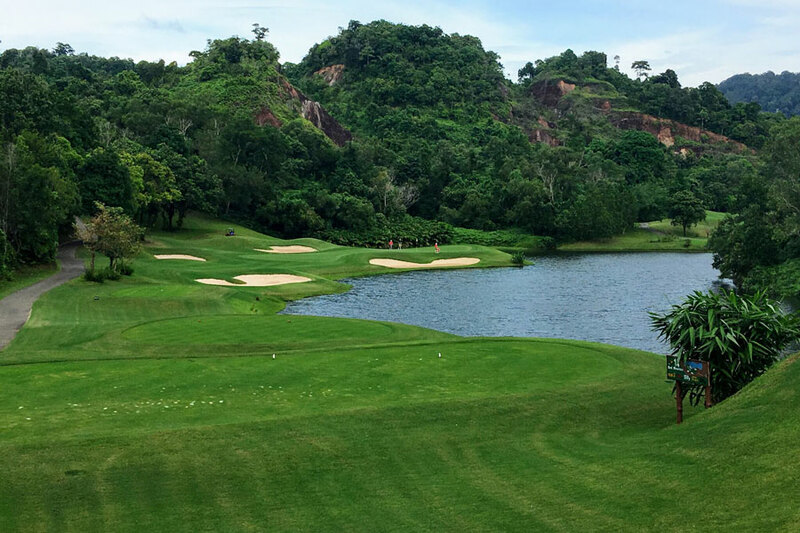 Having decided when you would like to visit, it is time to take a look at some of the tremendous golf courses near Patong Beach, starting with Red Mountain. Red Mountain is just 15 minutes away from Patong beach meaning you can start the day with a trip to the beach before playing golf or vice versa. 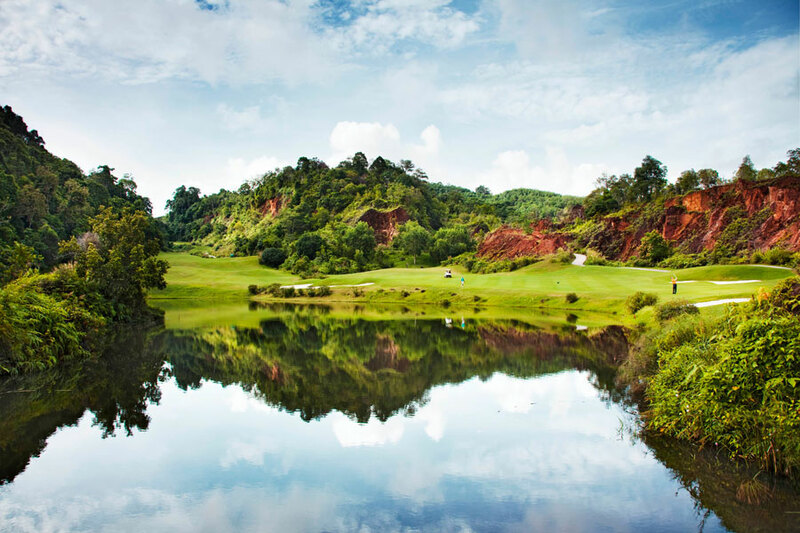 Red Mountain is considered by many to be the most exciting golf course near Patong Beach and it is easy to see why. Upon arriving at the golf course, you will quickly see why it has been named Red Mountain. The site of the golf course is an abandoned tin mine and the golf course makes full use of the site, taking in various aspects of the old mine throughout the 18 holes. Players are taken on a golfing journey through canyons and cliffs and due to the minerals in the rock, the mountains are red, hence the name of the golf course. Water features have been created by flooding the canyons and these are just one of the many hazards you will face at Red Mountain. Elevation changes, slopes, large greens, subtle breaks and wind are all part of the course and you will enjoy lovely views of Phuket from several points throughout the round. Be prepared for arguably the toughest finish of any golf course near Patong Beach when playing at Red Mountain. The final six holes are spectacular to the eye but a real challenge and you must try to maintain your focus to score low. Look out for the par-3 17th hole which features a steep downhill shot to a small green surrounded by jungle, it is excellent. When playing at Red Mountain you can take advantage of the driving range and pro-shop before stepping onto the first tee. As far as golf courses near Patong Beach are concerned, you will struggle to find a more spectacular offering than Red Mountain. For something perhaps a little less challenging when staying near Patong Beach why not book a tee time at Loch Palm Golf Club? This is one of the oldest golf courses near Patong Beach and despite being one of the shortest in the region, is considered by many to be the most fun. Situated just 15 minutes away from Patong Beach, Loch Palm Golf Club is another great example of a golf course which allows you to combine time at the beach and on the golf course in the same day. 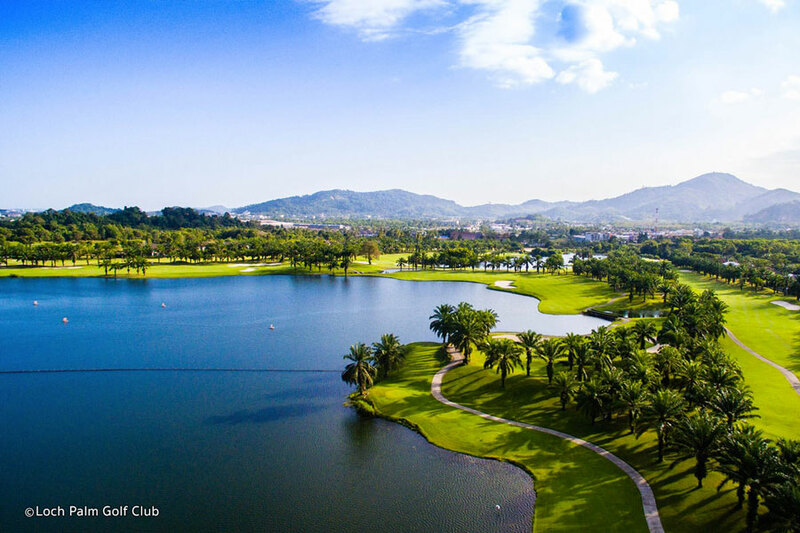 Due to the length of the course, measuring 6,555 yards, Loch Palm is considered to be easy going in in comparison to some of the other golf courses near Patong Beach. As the name suggests, there is a loch on the golf course and this sits alongside much of the front nine. The main objective is to keep the ball out of the water and if you can do that, a low score is a possibility. The par-5 2nd hole is perhaps the toughest, with not only water but large open bunkers coming into play. The back nine does not have as much water to contend with but the fairways begin to narrow and become more undulating. However, the par-3 14th hole does have water surrounding the green on three sides, so if you get nervous playing around water, you are not out of the woods yet. Unlike Red Mountain, golf carts are not compulsory when playing at Loch Palm Golf Club so you can walk the golf course if you wish. It is not a challenging work and allows you take in the surroundings as you head towards your next shot. The club house has a restaurant which serves traditional Thai food and it was renovated in 2008, making it as modern as many of the newer golf courses near Patong Beach. There is a small resort on the golf course which allows visitors to stay overnight but due to the close proximity to Patong Beach and Phuket, there is no need to stay. Loch Palm Golf Club is one of the best courses near Patong Beach and you can enjoy a pleasurable round of golf before heading back to the beach for the rest of the day. Moving from a golf course with a modern club house to the oldest golf course in Phuket, named Phuket County Club. This golf club was established in 1989 and is conveniently located between Patong Beach and Phuket Town. 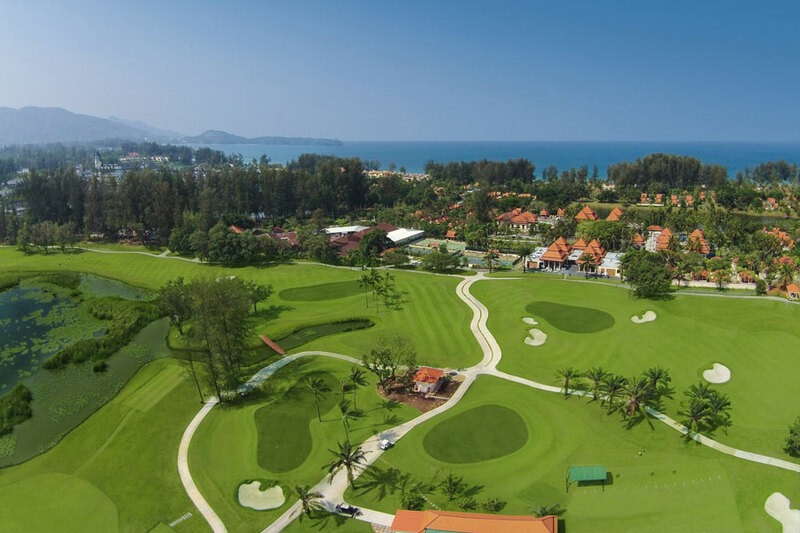 The first championship standard 18-hole golf course near Phuket, its short distance from the beach makes it a very popular course for tourists and locals alike. If you have been testing yourself on the golf courses around Patong Beach, Phuket Country Club may come as a shock due to the ease in which it plays compared to many other courses in the region. This resort style golf course is not punishing and even if you are wayward off the tee, you will have a chance of making a good recovery and registering a decent score on the hole. However, that’s not to say everyone will find the course easy and beginner golfers will still find this layout a challenge. You will notice three distinct sets of six holes, one set of which is undulated, one flat and the other played through forest. This will keep you on your toes as the style of golf and landscape changes throughout the round. The front nine holes are regarded as the toughest when playing at Phuket Country Club. These holes are the most undulating and require the most accuracy off the tee. There are two elevated tee boxes on the front nine but water does not come into play until the beginning of the back nine which is where you will find arguably the most famous hole in the Phuket region. The 10th hole at Phuket Country Club is a par-5 hole which plays to over 550 yards. Nothing new there but the layout of the fairway is something to behold and you are required to play around a ‘U’ shaped fairway, which surrounds a lake. You can play safe and follow the shape of the fairway around the lake or you can do as many other golfers do and attempt to cut across the water to reduce the distance to the green. In fact, long hitters can even attempt to land their ball on the green in one shot and the opportunity for a rare albatross is available. It’s a very exciting hole but be prepared for the possibility of a lost ball if you bite off more than you can chew. The island green on the par-3 17th hole is also a great addition to Phuket Country Club and one of the best short holes of any golf course near Patong Beach. The club house and facilities could do with some work having been built 30 years ago and perhaps don’t meet the high standard of the golf course. However, you will find lovely Thai hospitality in the club house and being so close to Patong Beach and Phuket Town, you can easily head back for something to eat and drink following your round of golf at Phuket Country Club. Last but not least of our golf courses near Patong Beach is Laguna Phuket. Situated just 20 minutes from Patong Beach, this is another golf course which allows you to enjoy a round of golf plus time on the beach all in the same day. Laguna Phuket opened for business back in 1993 but was renovated in 2014 to make the course more challenging and add new features. While not a hugely demanding golf course, Laguna Phuket makes you think and there are plenty of ways to play each hole. The fairways do not look particularly challenging but there are many undulations and mounds throughout the 18 holes which means you must consider where to aim your tee shots. Laguna Phuket is one of the best kept golf courses near Patong Beach and you can have no complaints about the quality of the playing surfaces, on both the fairways and the greens. As the name suggests, water features through the 18 holes at Laguna Phuket, with the front nine seeing much of the natural water on the course. The back nine holes are played through trees, some of which are over-hanging and can come into play on several holes. Bunkers are infrequent but the ones which do come into play are positioned strategically and you must be aware of them, especially when playing approach shots. The final two holes of Laguna Phuket are considered by many to be the most challenging and the 17th hole is a long par-5 measuring to 612 yards. Not only can the distance be troublesome, especially for beginner players but water crosses the hole twice, meaning you need to be accurate which each shot or face the prospect of a watery end. The 18th hole at Laguna Phuket is a par-4 and while the 17th hole can cause all sorts of problems for players; this hole offers the chance to finish the round in style with a birdie. Having completed the 18 holes, you can head into the club house which is nothing special to look at but houses a lovely restaurant. You can order a tasty meal before making the short journey to Patong beach to spend the rest of your day next to the sea. Complete with putting green, chipping areas, practice bunkers and a driving range, Laguna Phuket is a good place to hone your golf skills near Patong Beach. There are also luxury spa facilities available and these can be booked in addition to a round of golf to make a great day of sport and relaxation. There are many fantastic golf courses near Patong Beach and you could spend weeks in this region of Thailand playing golf and enjoying the surrounding area. The only question to answer is which of the wonderful golf courses near Patong Beach are you going to play first?